The Rupes LHR 75E Mini Random Orbital Polisher is a laser-guided, defect-seeking missile designed to target, then eliminate, paint defects with precision. This large-stroke mini polisher makes the once-tedious job of spot repair and intricate polishing a pleasure. The Rupes LHR 75E Mini Random Orbital Polisher Deluxe Kit is a highly-engineered kit designed for maximum results and the ultimate in user-friendly performance. The heart of this kit is the Rupes LHR 75E Mini Random Orbital Polisher. Like the other polishers in the Rupes Big Foot lineup, this a large-stroke dual-action polisher with a twist. The free-spinning, large-stroke design of the Mini gives it the ability to polish paint much faster than other �DA� polishers, which reducing the risk of overheating the paint, slicing through an edge or creating swirl marks. However it has been designed and optimized for use with 4-inch polishing pads, giving you fast and powerful polishing results in places were other powerful machines cannot reach. In the not-so-distant past, correcting severe paint imperfections such as deep scratches, and oxidation required a high-speed rotary polisher and a high level of skill. The Rupes LHR 75E Mini Random Orbital Polisher Deluxe Kit gives users of all skill levels the ability to correct paint defects quickly from the tightest areas, while maintaining the safety features inherent to a random orbital polisher. 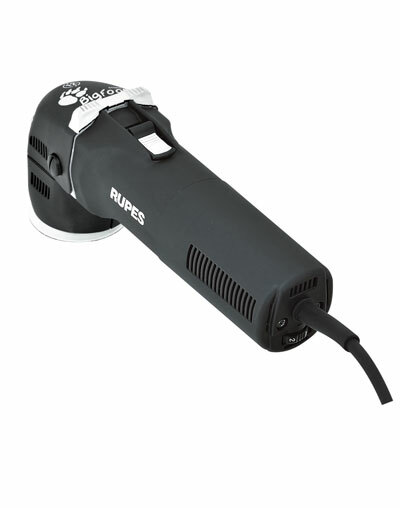 Rupes engineered each part of this kit to work together to deliver consistent results, from the machine's design to the weight of the 4-inch pads. Compared to most dual-action polishers which feature a 8mm (5/16 inch) stroke or throw, the Mini gets its polishing power from an impressive 12mm throw. For each orbit the polishing pad makes, the Rupes LHR 75E Mini Random Orbital Polisher moves the polisher 50% further, resulting in a dramatic reduction in the amount of time needed to correct paint. The Rupes LHR 75E Mini Random Orbital Polisher's large throw and impressive 400-watt motor ensure fast paint correction. Because it is a dual-action random orbital polisher, it will never create swirl marks so you can achieve a perfect finish in less steps. Unlike it's bigger Bigfoot brothers, the LHR 15ES and LHR 21ES polishers, the Mini features a traditional random orbital body. This ergonomically designed polisher features a thumb operated on/off switch and a speed dial for precise control. With its non-slip rubber inserts on the front cover, the Rupes LHR 75E Mini Random Orbital Polisher is easy to control in difficult-to-reach areas. The Anti-Spinning Shroud prevents the pad from over-rotating when lifted from the paint, for improved safety and longer pad life. Never before has so much polishing power been designed specifically for spot correction or polishing tight areas. The Rupes LHR 75E Mini Random Orbital Polisher features the same powerful motor and features as the Rupes LHR 12ES Duetto Random Orbital Polisher, but the entire machine has been optimized for use with 4-inch polishing pads. The Mini is extremely balanced and easy-to-use. Bumper lips, tight body lines, creases, around emblems and door handles, around trim, and along vents or scoops are now easy to access and even easier to polish. The Rupes LHR 75E Mini Random Orbital Polisher puts the power of Big Foot in your hands so you can polish away paint defects no matter where they are. Designed specifically for the Rupes Mini Big Foot Polisher, this backing plate is perfectly weighted to maintain ideal vibration dampening when used with Rupes' pads. The built-in Anti-Spinning Shroud improves safety, pad life and machine useability. Carry your Rupes' products in style! The Rupes Big Foot Soft Polisher Bag holds all of the components included in the Rupes Mini Random Orbital Polisher Kit comfortably so you can take your paint correction tools on the road with you. Constructed of water resistant nylon and ruggedly built, this bag can withstand the power of Big Foot. The Rupes Blue Coarse Foam Pad 100 mm (6 inch) is an open celled foam compounding pad that is designed for maximum polishing action. Use this pad with Rupes Zephir Gloss Coarse Gel Compound on the Mini Big Foot to eliminate severe paint defects such as acid rain marks, oxidation, deep scratches, and 1500 grit wet sanding marks. The Rupes Yellow Polishing Foam 100 mm (4 inch) is a tightly packed open cell foam pad designed to smooth away paint imperfections without creating visible scratches. Use this pad with Rupes Keramik Gloss Fine Gel Polish on a Mini Big Foot Random Orbital Polisher to level fine paint defects such as towel marks or to remove heavy buffer holograms.